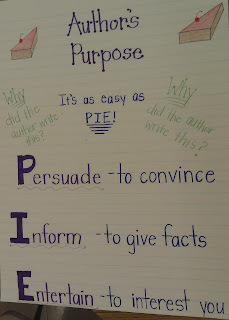 This is a lesson I did with my third graders on author's purpose. 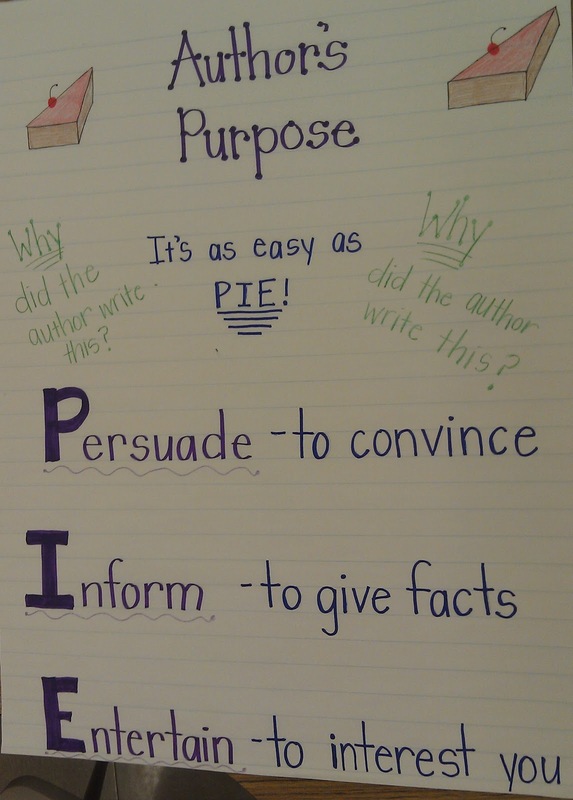 With the anchor chart, I introduced the three main author's purposes: inform, entertain, persuade. Students glued a copy of the anchor chart into their reader's notebooks. On future days, students referred to the anchor chart to refresh their memories. I like to encourage students to use their resources to find the answers to their questions. The next day, we read Jimmy's Boa and the Big Splash Birthday Bash by Trinka Hakes Noble. After making predictions and reading/discussing the text, we completed the author's purpose graphic organizer for the story. (entertain) For their reasoning, students explained that the book was a story with characters and a plot. Also, this book was funny and clearly meant to be entertaining! When finished, students completed a written response in their reader's notebooks about whether they think the narrator exaggerated the events. Again, students must support their thinking!